A death certificate is an official government record of a person’s death. It lists the official cause and location of death, and the time and date the death occurred. Death certificates serve two important purposes: To provide an official record of death in order to gather vital statistics for Georgia and the country and also to provide a deterrent for coverups after a wrongful death or murder. Family members or a legal representative can request Georgia death certificates in person or via the internet or U.S. mail. In-person requests are honored on the same day, while other methods can take anywhere from five days to eight weeks. The funeral director or another person who handled the deceased’s remains files the death certificate with the county health department. A physician or medical examiner must sign off on the certificate before the filing. 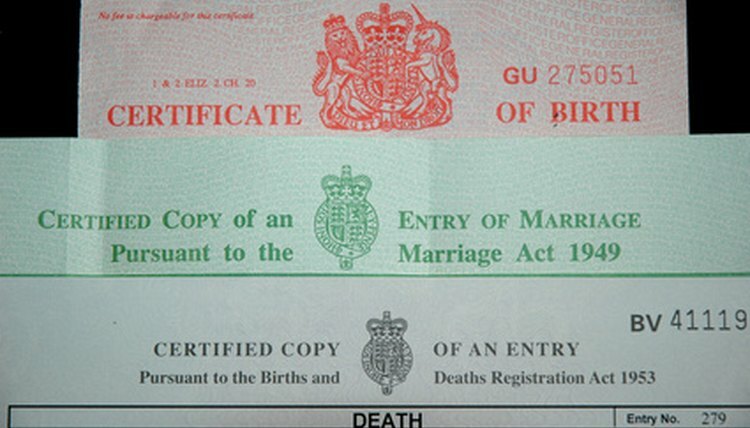 Why Is It Important to Have a Death Certificate? A death certificate can bring closure to a family. It serves as a legal document to bring personal and business accounts to a close. It's necessary for life insurance claims or if a spouse wants to access pension, healthcare or retirement benefits. Having a record of the time, date and cause of death is also important if foul play is suspected at a later time. Death certificates provide vital records to the Georgia Department of Public Health as they work to compile data relating to causes of death. Having death certificates on file enables officials to note trends and leading causes of death. Information regarding causes of death help to bolster research, raise public awareness and determine if there is a rise or a decrease in certain diseases and conditions. Death certificates are the only source of information available for the department of public health for studying causes of death and mortality rates. Anyone requesting a Georgia Death Certificate form can do so by downloading a copy at the Georgia Department of Public Health website. A valid picture ID, such as a driver's license or passport, and a signature is necessary to receive the document. There may also be a fee depending on the method used for the request. Make in-person requests for death certificates at the state or county department of vital records. The offices have walk-in hours, but it's a good idea to check to see which days and hours they're open. There is a fee of $25 for one certificate and $5.00 for each additional request. To make a request via mail, download the Request for Search of Death form at the Georgia Department of Health Website. Complete all required information and include a copy of a valid photo ID and a fee of $25.00 for one certificate, plus $5.00 for each additional copy. Mail the form, copy of ID and certified check or U. S. money order to: State Office of Vital Records, 1680 Phoenix Boulevard, Suite 100, Atlanta, Georgia 30349. Make death certificate requests online at the approved third-party vendors GoCertificates.com or Vitalcheck.com. ROVER at the Georgia Technology Authority is another approved online source. All services require a fee plus additional surcharges for credit card payments and expedited requests. Email and telephone requests are not available. In most cases, anyone requesting a death certificate in person should receive it on the same day. Electronic and mail-in requests take longer. Death certificates take between four and eight weeks through the mail and between two and four weeks for online requests. Those who pay expedited fees with online orders can expect to receive the certificate in five business days. Deb Ng is a freelance writer and published author with over 17 years of experience in creating content for the web. Prior to her freelance career, she worked for over 12 years in traditional (print) publishing. Deb's has an interest in legal matters and has been writing content for websites such as Legal Zoom, Wiley Publishing, and Pfizer Pharmaceuticals for over ten years. Ng, Deborah. "How to Get a Georgia Death Certificate." , https://legalbeagle.com/6396377-georgia-death-certificate.html. 24 July 2018. How do I Obtain Free Autopsy Reports?